Considered the most prestigious event of its kind, Pebble Beach Concours d’Elegance (“a competition of elegance”) is the conclusion of a week long festival of classic cars events in the Monterey area, California. This year, a Mercedes-Benz built in 1928 won Best of Show, Baroness von Krieger’s 1936 Mercedes-Benz 540K was sold for $11.77 million, while a 1968 Ford GT40, sold for $11 million, set a new record as the most expensive American car ever sold at auction. On the third Sunday of each August (August 19, 2012) the most refined cars in the world are displayed on the Pebble Beach Golf Links in Pebble Beach, California. Around 200 of the most prized collector cars and motorcycles are presented on the best finishing hole in golf, the famed eighteenth fairway at Pebble Beach. Bugatti, Daimler, Delage, Duesenberg, Jaguar, Mercedes-Benz, Packard, Rolls-Royce, are represented, along with Alfa-Romeo, Aston Martin, Cadillac, Chrysler, Cord, Isotta-Fraschini, Lancia, Maserati, Stutz and Talbot-Lago. The 62nd edition of Pebble Beach Concours d’Elegance included fifteen Cars of the Maharajas, twelve marques (brands) of Mercer (road and race cars, including Mercer Raceabout) and eight marques of Fiat (Grand Prix racers, coachbuilt prewar classics, and small postwar cars, with variants on the original Fiat 500). Special classes presented eleven cars designed by Jacques Saoutchik (Bugatti, Delahaye and Pegaso), nine roadsters Shelby Cobra, designed by Carroll Shelby in collaboration with AC Motors, ten American Sport Customs (1930s–1950s), German Motorcycles (BMW, DKW, NSU, Zündapp, including an 1885 Daimler Reitwagen, the world’s first actual motorcycle). The maharajas (great kings) of India and South Asia bought hundreds of expensive cars (Rolls-Royce, Daimler, Hispano-Suiza, Maybach, Bugatti, Duesenberg, Minerva) during the last century. Lots of those cars were custom built for hunting or display. Over 800 Rolls-Royces were shipped to India between 1900 and 1950. Seven of them, built between 1924 and 1937, were displayed. One of them still belongs to the Maharaja of Udaipur, another (the “Star of India” of 1935) to the grandson of the maharaja who first bought it. The Maharajas Collection also includes a 1930 Bentley, a 1930 Delage, a 1935 Duesenberg, a 1925 and a 1935 Hispano-Suiza, a 1930 Mercedes-Benz 27/140/200 Type SS, and two “swan”-shaped vehicles comissioned by the Maharaja of Nabha in 1910 and 1919. The 1910 Brooke motor car, brought from the Louwman Museum in The Hague, was commissioned by Scotsman Robert Nicholl Matthewson, who lived in India in the early 1900s. It is modeled after a swan, and it is equipped with eyes that light up, a beak that opens, closes and sprays steam, and an eight-tone horn. The three best cars in twenty categories (plus one for German motorcycles) are awarded and one of them is chosen “Best of Show”, with two runners-up. Buggati has won “Best of Show” nine times since the beginning of the Pebble Beach Concours d’Elegance. It is followed by Duesenberg and Mercedes-Benz, each of them with six victories. Rolls-Royce had five victories; and Daimler, Delage, Jaguar and Packard, three each. 1928 Mercedes-Benz 680S Saoutchik Torpedo, entered by Paul and Judy Andrews of White Settlement, Texas, won Best Of Show at Pebble Beach Concours d'Elegance 2012. 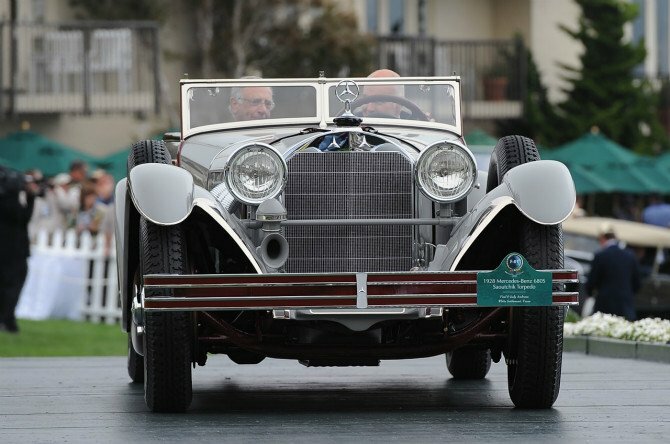 Mercedes-Benz acquired its seventh victory with the 1928 Mercedes-Benz 680S Saoutchik Torpedo entered by Paul and Judy Andrews of White Settlement, Texas. The car is one of seven Torpedo bodies designed by Jacques Saoutchik for the Mercedes-Benz 680S chassis and is powered by a 6.8-liter supercharged engine (somewhere between 200 and 300 horsepower). This low-windshield appeared at the New York Auto Show in 1928, was sold to Frederick Henry Bedford and spent 30 years in storage before receiving a total restoration. During Pebble Beach Concours d’Elegance, classic-car auctions are held by Gooding and Canadian RM Auctions at the nearby equestrian center. An auction world record was set last year, when a 1957 Ferrari Testarossa was sold for $16.4 million. Gisela von Krieger’s silver-striped black 1936 Mercedes-Benz 540K Special Roadster, although expected to break the record, was sold for $11.77 million at Gooding’s auction, while a 1968 Ford GT40, sold for $11 million (RM Auctions), set a new record as the most expensive American car ever sold at auction. 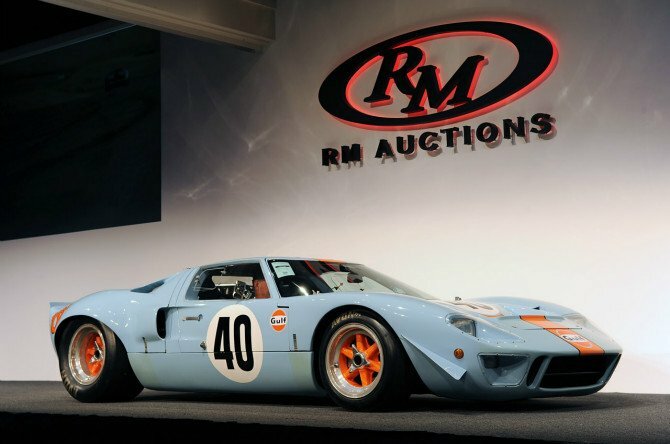 The 1968 Ford GT40 is an extremely rare racer (one of only two surviving) and it was used as a camera car by Steve McQueen for his film “Le Mans” (1971). 1968 Ford GT40 made a record as the most expensive American car sold at auction, at Pebble Beach Concours d'Elegance 2012. Considered the automotive equivalent of a coveted Picasso painting and known as the Von Krieger’s Special Roadster, the 1936 Mercedes-Benz 540K had only two owners, Gisela and, after her death, Lee Herrington. This rare car is one of 26 540K Special Roadsters, and was built on special order before World War II. Baroness Gisela Josephine von Krieger was considered one of the ten most fashionable women in the world. She made the car her own, although the car was bought by aristocratic von Krieger family for the use of her brother, Henning. When the war started, Gisela refused orders from the Third Reich to return home from France and sent the car to Switzerland. After the end of the war, Gisela lived in Manhattan, but kept the car at the Homestead Inn in Greenwich area, even after when she moved back in early 1960s to Switzerland. At her death in 1989, the car was valued $2.5 million. The vehicle was discovered untouched, with pink lipstick-stained cigarette butts in the ashtray, vintage roadmaps of New York and Connecticut in the door pockets and a woman’s driving glove in the glove box. 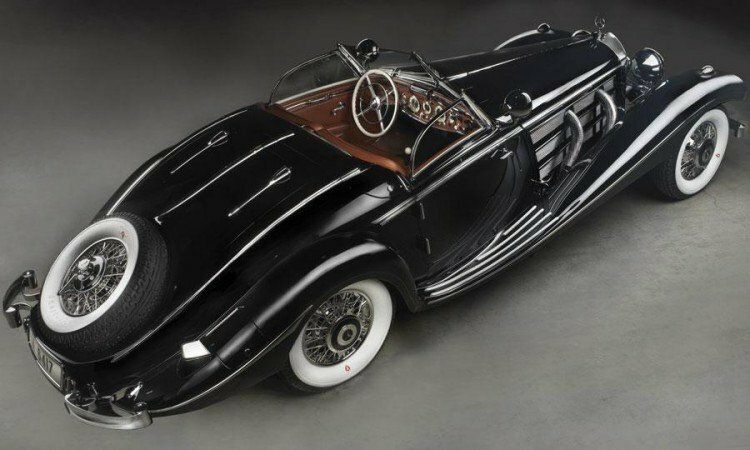 The radiant black-and-chrome roadster with an interior of saddle leather and wood veneer is one of perhaps a dozen left in the world, and represents the height of prewar German automotive engineering. Mercedes-Benz wants to preserve classic cars and to encourage collectors, it has a Classic Center which offers customers hard to find parts. During the Pebble Beach Concours d’Elegance, the annual Mercedes-Benz gala dinner honored car collector Arturo Keller with its coveted Star Driver Award. You can find car parts for Mercedes-Benz “All Years and Models” at www.ecklersmbzparts.com.